It was their 100th meeting, it was supposed to be a finely balanced affair, but before half time it was all over. 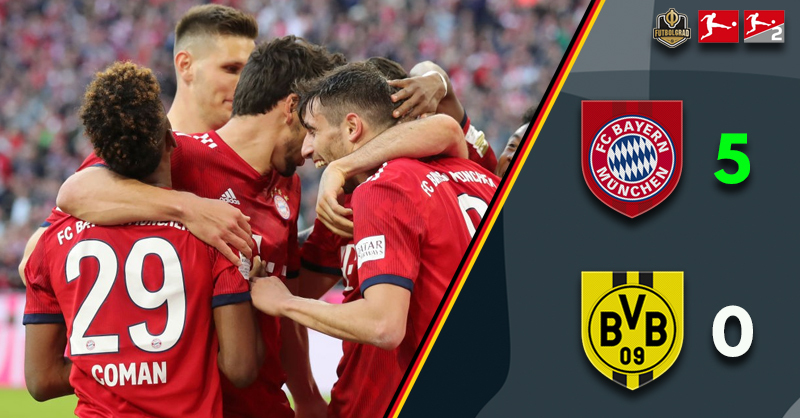 Bayern Munich vs Borussia Dortmund was an evening to remember for the Bavarians as they sent out a warning to all of Germany – the title is now theirs to lose. As games go, this one couldn’t have been any closer prior to kickoff. The visitors had a two-point advantage at the top of the table and Bayern could ill afford that gap to become five. The Allianz Arena didn’t have to wait long for the first chance of the evening. Mats Hummels pulled free to head a glorious opportunity just over Roman Bürki’s crossbar inside 90 seconds – it should have been an early warning for those in Yellow and Black to keep their eyes on a familiar face. The game took on a blistering pace – for the most part, it was a sea of red and white that dominated the early proceedings. However, a wonderful one-two between Jacob Bruun Larsen and Marco Reus set up Mahmoud Dahoud. The Dortmund midfielder somehow guided his shot onto the outside of Manuel Neuer’s right-hand post from eight yards. Dahoud’s miss would prove to be a key moment – as would the failure to heed an earlier Hummels warning. Finding his range inside two minutes, the ex-Dortmund defender wasn’t to let his second free header go unpunished. In an almost nonchalant move, Hummels casually ran into the area and out jumped all those around him in yellow. He then powered a header past Bürki from Thiago’s expertly whipped in corner. It was nothing less than the hosts deserved. If there had been a failure of late to take their chances, Bayern looked keen on resetting the imbalance. Dortmund looked shellshocked, mistakes began to appear in every area of the pitch. None more so than Dan-Axel Zagadou, with the fixture just 17 minutes old the centre back made his third mistake – it was to be as costly as it could possibly be. Robert Lewandowski lobbed a wayward ball over the advancing Bürki and hammered home his 200th Bundesliga goal. It was becoming too easy for the hosts, for Dortmund it was about to get a lot worse. After missing a number of chances, Bayern stepped up into another gear – it became sixth gear football. Javi Martínez stroked home the Rekordmeister’s third on 41 minutes before Serge Gnabry nodded in a fourth two minutes later. As the half time whistle sounded, 4-0 was a let-off for Dortmund – it could have easily been five or six. Lucien Favre rescued Zagadou, hooking the defender during the half time break and replacing him with Julian Weigl. The young French centre back had a woeful first half, winning just 33% of his challenges. As with any side that is facing a 4-0 deficit at the break, the second half must be tackled in a positive way. Dortmund’s body language as they stepped back onto the Allianz turf had all the hallmarks of a team already beaten. Ten minutes into the restart and the visitors’ movement was as poor as the 50 previous. Bayern, they just picked up where they left off. Probing and testing a dejected Dortmund. Gnabry was unlucky not to register a brace after more good work by Thiago as the clock headed towards an hour gone. For the final 30 minutes, it became a training game for the champions. A procession of chances and went, for once Bayern weren’t as clinical as they could have been – but at 4-0 they didn’t need to be. Just as Dortmund thought they’d escaped without conceding a second-half goal, up stepped Lewandowski to tap home a fifth on 89 minutes. It had become a day to forget for Dortmund. It was the most emphatic of ways for Bayern to answer their critics, both inside and outside of the club. After stumbling at Freiburg last weekend, then almost falling to Heidenheim in the Pokal – Bayern stormed back to the top of the Bundesliga. 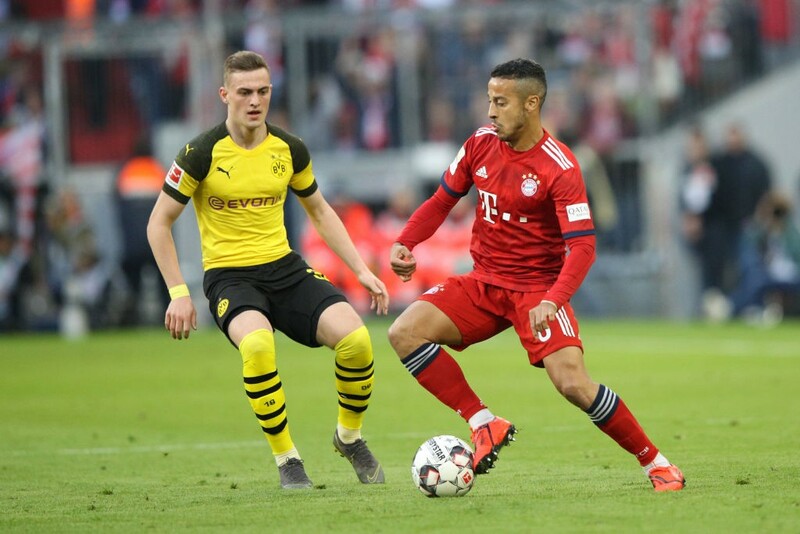 With two big assists and a totally dominant midfield performance, Thiago was a man mountain just when Bayern needed him to be. The Spaniard seemed to be ever-present across the central area. Not limited to the central portion of the pitch, or the wide areas – he was everywhere, it was a truly magnificent display. Were Bayern Munich that good or Borussia Dortmund just that bad? In truth, it was both. The Bavarians were simply unplayable, better in every area and far more clinical than seen of late. Of all the criticism laid at Niko Kovac’s door recently, for this game – their biggest test, he got everything right. Dortmund’s first-half collapse allowed their main title rivals to rocket back to the top of the league. What is more worrying for the Schwarzgelben is Bayern’s goal difference, it is effectively another point under their belts.